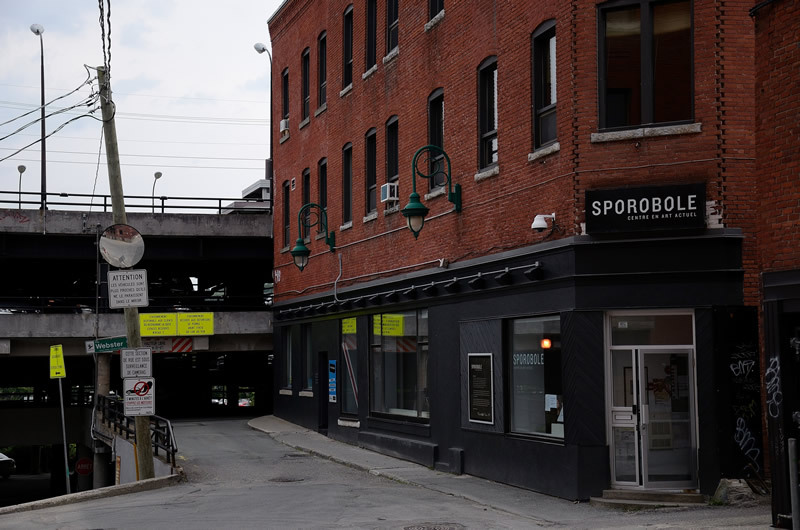 The recent history of multichannel audio at Sporobole, an artist-run centre located in Sherbrooke, Canada, is discussed based on a multidisciplinary exercise. The underlying working axes are presented, from the experience of hosting an experimental rock band in an artistic, electroacoustic, and multichannel context, to the centre’s development, which includes a multichannel sound studio in its recently renovated building. The challenges and design of the modular, flexible, and multichannel studio are discussed and solutions are reviewed and shared. In 2013, the studio was inaugurated by three sound artists and composers who were commissioned to create a specific work for an innovative multichannel sound projection platform, the Sound Window, comprised of a linear arrangement of 16 independent loudspeakers on Sporobole’s exterior facade. The sound artists’ creative and artistic strategies for the Sound Window in the new studio are discussed and reported. In April 2012, the experimental rock trio AIDS Wolf was invited by the curatorial sound collective ASME to play for a night as the third in a series of special concert evenings held at Sporobole, an artist-run centre in Sherbrooke (Canada). They were invited to play in a remote yet visible building while the sound was spatially reproduced in a smaller-scale mock-up of the actual room in Sporobole’s gallery space. It was an intriguing night and a first experiment in multichannel sound creation and curating at Sporobole. This exploratory event led to several subsequent developments within the fields of spatial sound and sound art at the centre. The aim of this paper is to report these developments and draw out their significance from a multidisciplinary vantage point that takes space as its main focus. If the analytical framework and terminology for sound art are still in their infancy (Voegelin, 2010), music undoubtedly benefits from a longer history of analytical methods. One example of a recent effort to define terms and categories is provided by Landy (2007), who takes music as an inclusive starting point. This paper adopts a free position with respect to the definition of terms and classification of genres. The resulting potential ambiguity of definitions’ zones and territories (Landy, 2007, p. 9) is exploited in favour of a free circulation of references and interpretations while being equally influenced by musical and artistic considerations. Interestingly, the interaction of space and sound is a common point of debates and discussions for both composers and sound artists. This methodological position is coherent with a desire to follow the interplay and dynamic redefinition of music or sound art that emerges from the simple interaction of several elements: (1) presentation context, (2) audience background, and (3) presentation of artist’s statement and background. It also reflects the organisation of typical artist-run centres in Québec, where the collaboration and circulation of various people, from a plethora of different backgrounds, interact to create and reshape the vision and mission of the organisation over time. The paper is structured chronologically, and general interpretations are provided at the end of the paper. This chronological structure has been chosen in order to illustrate the practical feasibility of spatial sound creation and presentation outside the academic realm in a small-scale organisation. The ASME collective (Arts Sonores Musiques Expérimentales/Sound Arts Experimental Music, comprising Éric Desmarais, Olivier Doutres, Philippe-Aubert Gauthier, Tanya St-Pierre) was formed in 2011. Through practical experiments in 2011 and 2012, ASME investigated the thin boundaries between musical practices and what is known as sound art. The curatorial approach was based on the simple and pivotal idea that the presentation of experimental or more conventional music bands in a surprising and very concrete listening context (or perhaps more precisely, in an unusual location) challenges the status of music as the art of organised sound and musical structures. ASME’s goal was to foster an environment that encouraged listeners to question the aforementioned boundaries, the reading and interpretive mechanisms, and the cultures typically associated with live music presented in traditional settings (or with “rituals associated with the musical arts” (Landy, 2007, p. 8)). The idea was to play with typical and documented listening modes (see Barrett, 2007, for a summarised version of the Quatre Écoutes) and to experiment with how they interact with context, artist, and audience experience. Finally, the fact that these events were presented in Sporobole’s gallery space is not alien to ASME’s objectives. Indeed, the mission of Sporobole is to promote the production of knowledge through experiential approaches and the creation of multidisciplinary interpretative contexts and situations. A transition from note-based “alphabetism” – a sort of grid of the symbolic – to a continuous frequency spectrum is how Kittler summarises one major transformation in music and sound culture of the past century (Kittler, 1999). The densification of the discrete spectra of musical notes and scales towards the continuous (Kahn, 1999) is also related to the flow of emerging ideas and people behind psychophysical sciences of hearing, sound reproduction technologies, and avant-garde composition (Sterne, 2012, p. 95). These documented examples illustrate the impact of transactions between agendas and people within the arts, sciences, and technology. Inspired by these transactions, ASME consciously operated within this historical trend while taking into account its own contemporaneous scientific context and specificity for its first event. However, ASME’s initial concern was not frequencies or notes, but space. As techniques and technologies for sound recording, storage, transmission, and reproduction have improved in terms of fidelity, in the audio engineers’ understanding of the word (i.e. flat frequency response and reduced non-linear distortion; see Sterne, 2012, for further discussion), sound reproduction challenges have begun to extend into another dimension: the recreation of spatial impressions for the listener. Several musicians and artists who were trying to initiate an art of sound outside the existing critical grid of music had already used space as a substitute for time in their work, time being considered to be in the realm of music. Examples include the works of Max Neuhaus and La Monte Young. They introduced the transition from the time of the composer to the spatial movement of the listener (Labelle, 2006; Licht, 2007). More recently, one also finds the more conceptually open idea of space with respect to sound and sound art (Kim-Cohen, 2009). For many, the substitution of space for time is one of the characteristics of the emerging sound art of the past century (Kim-Cohen, 2009). For its event with AIDS Wolf, ASME wanted to play explicitly with this dimension of sound. Yannick Desranleau and Chloé Lum founded AIDS Wolf in 2003. The band subsequently built a body of compositions and songs using intentional dissonance, polyrhythms, and disjunctive forms. Alexander Moskos joined in 2008, when the more typical rock quartet format was replaced by a novel trio format (drums, guitar through two amps, and voice) augmented with guitar effects and voice synthesis. For its evening at Sporobole, ASME freely experimented with wave field synthesis (WFS) ideas (Berkhout et al., 1992) derived from the Kirchhoff-Helmholtz integral theorem (Williams, 1999). Influenced by the informal proximity of and social relations between the people of Sporobole and GAUS (Groupe d’Acoustique de l’Université de Sherbrooke), and also inspired by the historical experiments and publications of Steinberg and Snow (Snow, 1953; Rumsey, 2001), ASME planned to de-locate AIDS Wolf’s performance and, at the same time, achieve real-time spatialised sound reproduction of the remote action in order to create an electroacoustic situation that fluctuated between noise rock, electroacoustic music projection, and sound art. It was established that the principal curatorial idea was to work with a re-located performance and a real-time spatial sound projection within a 50 percent scale mock-up of the performance space, which was in a building located just in front of Sporobole gallery’s large windows. The apparatus produced a de-located visual performance of a trio famous for the intensity of their live presence. This partial deprivation of the live experience was compensated for by an unusual art installation within a typical exhibition space. The physical absence of the musical performance and its replacement by a sound installation relying on electroacoustic music spatialisation – transforming a musical concert into sound art by way of a blurry juxtaposition – was ASME’s main interest. At the same time, the performance space was visible from Sporobole’s windows, thereby creating a spatially separated visual and sound presentation of the same event and investigating the tension of the empty in-between space of the street. This was itself a physical site that was investigated further in Sporobole’s work with spatial sound. To achieve a real-time spatial sound reproduction from the remote location to the mock-up, ASME relied on multichannel sound transmission in which each microphone was routed to a single loudspeaker. Let us recall the principles of the Kirchhoff-Helmholtz integral theorem and WFS (see also figure 1). The integral theorem states that a sound pressure field, that is, sound waves in a given volume (e.g. an actual room or a subpart of it), is uniquely defined by the sound pressure and normal sound pressure gradient on the volume of the surrounding surface (e.g. volume boundary, real or virtual). In other words, this is a screen analogy in which sound impinges on a sensor array before being reproduced by a screen of transducers: times of arrival and gains are transmitted and reproduced for each individual channel. The screen analogy was introduced by Steinberg and Snow at Bell Laboratories in the 1930s and later when discussing the basic principles of stereophonic sound perception (Snow, 1953; Rumsey, 2001). With reference to sound field reproduction, the Kirchhoff-Helmholtz integral theorem states that if the sound field is continuously recorded over a boundary surface and sent to a reproduction source array on a similar surface, physical reproduction of the sound pressure field in the surrounded space would occur as though it was real or natural. If the listener’s head is immersed in a physical reconstruction of a target sound field, natural localisation cues should lead to proper sound localisation. These principles are the basis of WFS systems, which are typically built using hundreds of loudspeakers organised in dense arrays. The corresponding concept of the the screen analogy is shown in figure 1. This screen analogy was a starting inspiration for the production of the event. Figure 1 (a) The screen analogy and practical realisation of WFS. (b) The microphones, loudspeakers and signal routing for the AIDS Wolf concert and mock-up installation. If WFS is prohibitive in terms of cost (as a result of the number of channels needed) it is important to keep in mind how historical and recent researches illustrate how practical WFS implementation using a limited number of channel can nevertheless achieve the screen analogy successfully, at least in terms of perceived sound. Indeed, even if WFS finds its origin in the experiments of Steinberg and Snow, one of the conclusions put forward by Snow at that time is that a practical compromise using a reduced channel count (three in the example he gives) can lead to satisfactory results in terms of spatial perception. The hearing mechanism fuses the separated loudspeaker signals into“an illusion of a single sound … coming from a virtual sound source” (Snow, 1953, p. 572). This idea has found a place in recent WFS researches and developments. As an example, a practical compromise that uses WFS driving signals with a reduced number of loudspeakers is one of the working avenues of Sonic Emotion, a commercial provider of WFS technology to concert halls and venues. ASME freely transposed these ideas and the screen analogy using an eight-channel microphone array located in the room where AIDS Wolf was performing. The eight microphones were positioned in the centre of the room, facing the amplifiers and the band. Each wireless microphone was directly connected to one of the eight PA loudspeakers located inside the mock-up and each channel was set to a fixed and similar gain. The final setup is shown in figure 2. As indicated in figure 1, if a sound source in the actual performance room was closer to one of the microphones, this microphone would pick it up sooner (with respect to other microphones, because of finite sound speed) and with a stronger signal (with respect to other microphones, because of sound geometrical spreading, i.e. level reduction with increased distance from the source). The corresponding loudspeaker would then radiate this sound first in time and also more loudly in comparison with the other loudspeakers. According to spatial hearing cues such as interaural level difference, interaural time difference, and the precedence effect (Blauert, 1997), the fact that this sound would first emerge from the corresponding loudspeaker, and with higher gain, should automatically trigger hearing localisation in the area of that corresponding loudspeaker, hence effortlessly simulating the band’s spatial distribution. However, this application example does not produce sharp sound distribution (e.g. the drum in a single loudspeaker), but rather a complex sound radiation pattern inside the mock-up, and therefore heightens the sensation of walking around a small band performing inside the building mock-up with sound bouncing from all directions. Figure 2 Top: Mock-up assembly and sound tests in the exhibition space. Photograph: Tanya St-Pierre. Bottom: AIDS Wolf in the performance space for a sound check. The eight wireless microphones create a circle in the centre of the performance space. Photograph: Philippe-Aubert Gauthier. On the evening itself, the audience was informed of ASME’s ideas and aims in an introductory statement. AID Wolf played without intermission, creating a dense sound stream that continuously activated the sound apparatus. Listeners could therefore focus on auditory spatial impressions while moving around the mock-up and listening to the subtle spatial distribution of the sounds, drums, and amplifiers. The visual connectivity with the remote space (where the band was actually playing; see figure 3) created an effective representation of the concept as the wireless system involved no audible latency. Furthermore, it was sometimes possible, regardless of the noisy improvisational mass, to correlate a visible drumming movement with a given sound. One initially unplanned consequence (a result of the extremely high sound pressure levels in the space where the band was improvising) was that it was possible to hear a stereophonic mixture of direct and reproduced sounds while walking on the street between Sporobole and the remote building. AIDS Wolf thus managed to activate the space between the two buildings, penetrating the intermediate urban space in an auditory and visual manner. This event significantly influenced Sporobole’s future developments with respect to sound, as the sidewalk and the street were chosen as the next site for the public presentation of sound art. Figure 3 Foreground: Mock-up in gallery space. Background (right): Remote location with AIDS Wolf playing in the remote building. Visitors experienced different viewpoints of the performance and installation. While circulating around the room mock-up and sound reproduction system in the exhibition space they experienced a real-time spatial sound diffusion of the band. Photograph: Jocelyn Riendeau. After this initial experiment using multichannel sound as a fundamental issue to be investigated in a collaborative and creative process involving both artists and the centre, it was decided to continue in this direction for some of Sporobole’s future programming. This was a key moment for the centre. At the same time as the ASME/AIDS Wolf event, Sporobole was negotiating a special agreement with Université de Sherbrooke that would generate new revenues. The agreement made reference to a special new graduate program in contemporary art practices that required specifically-designed rooms for its studio classes, which the university could not accommodate. The university was interested in Sporobole providing space and a professional context that would benefit students. With this agreement, Sporobole could renovate its building and alleviate the fact that a considerable amount of its space was leased out and not serving the centre’s core mandate – promoting contemporary arts in all their creative, production, and diffusion phases. The opportunity to revamp the building was timely. The board of directors had to determine the rooms’ future purposes quickly as renovations were already planned for the first and second floors. Without hesitation, it was decided to go ahead with new production spaces that could be used by visiting or exhibiting artists or by other artists who could rent the production studio. It was decided to create (1) a digital print studio comprised of a photo shooting area, large-scale printers, calibrated screens, and a 3D printer, and (2) a 3D video and 3D audio studio with 16 studio monitors. However, the design and construction of these studio spaces presented several challenges. For sound composition, sound art, or electroacoustic music that integrate or deal with space, both architecture and building design are key (Barrett, 2007; Blesser and Salter, 2009; Labelle, 2006). In this section, the targets, challenges, and creative design strategies for a multichannel spatial sound studio in a small-scale, yet growing, independent artist-run organisation are summarised in order to show that it is possible to develop an advanced sound studio outside the academic realm on a limited budget. The audio industry has knowledge of the methods proper to sound studio design (Ballou, 2008). However, most of the documented design strategies are concerned with 2-channel or 5.1 Surround Sound listening or mixing rooms that are part of a standard-format workflow of audio production for commercial or standardised outputs. These design guidelines cannot be directly translated to audio creation without the risk of creating an inflexible and inappropriate working environment for sound artists or composers. Often, for these creators, sound projection and space are an integral part of the actual piece, whether it is a composition for fixed media, an interactive piece, or a sound installation. A sound projection platform is not merely a neutral or transparent window; it is part of, or at least affects, the piece and its reception. With this in mind, the main design requirement for Sporobole was modularity and accessibility, using affordable software and spatialisation tools so that visiting artists could translate the software processing in their home-studio or standard personal working environment at a low cost. The 3D sound studio had to be built from scratch in a former artist’s studio. This was achieved at the non-negligible cost of C$70,000 (just over £40,000). Sound treatment aims to ameliorate the acoustical response properties of a room such as frequency response, reverberation time, and specular reflection. Typical solutions include a combination of non-rectangular geometries for walls to create less-regular resonance frequency patterns, acoustical damping of the wall surface to reduce sound reflection, and sound diffusers to provide non-specular reflection, thus eliminating echo. Again, the design requirements of the audio industry (Ballou, 2008) can only be achieved at high cost. The Sporobole team decided to proceed with a simple yet efficient custom-made sound treatment based on knowledge available from the acoustic community to reach an equilibrium between cost, efficiency, and sharable knowledge. To acoustically damp the wall surfaces, the walls were equipped with black acoustic curtains on rails. The floor was treated with commercial carpet over an acoustical floor. It is acknowledged that the combination of surrounding curtains with facing parallel surfaces (floor and ceiling in this case) made of less acoustical absorbing material creates a specific acoustical condition: flutter echo. To get around this, it was decided to include sound diffusion where it was impossible to include curtain or drapery, for example on the ceiling. The aim of sound diffusers is simply to reflect incoming sound waves in many different directions. As well as reducing the risk of flutter echo, they also retain an interesting amount of reverberation, while preventing any specular reflection. Many types of sound diffusers exist, and many are not affordable. Therefore it was decided to build cheap custom diffusers. The design method for custom diffusers is relatively simple. Design begins by selecting the diffuser order, then a formula by Schroeder (1975) is used to compute the depths of the wells. Other parameters include maximal depth and well sizes. The free software QRDude (QRDude, 2013) was used to calculate the wells’ maximum depth, depth pattern, and width. 2D diffusers were then made out of wood. The diffusers were made in two sizes: full-depth diffusers were very heavy and were used on walls where curtain rails could not be installed; lighter half-depth diffusers were installed on the ceiling. Once they were installed, there was a noticeable reduction in flutter echo. The diffusers and curtains can be seen in figure 4. Figure 4 Multichannel sound studio at Sporobole. Photograph: Martin Guimont. Once completed, the studio was equipped with 16 loudspeakers, a computer, and a analog-digital/digital-analog converter. Genelec 8030B monitors were selected on the basis of their renowned quality. A Windows-based computer was then chosen to reduce the expense in comparison with other brands. Furthermore, the main software that was selected as a multichannel Digital Audio Workstation was Reaper by Cockos. Reaper is an affordable cross-platform tool that seriously competes with other expensive audio software. It was important, in accordance with Sporobole’s idea of sharable knowledge, to select software that artists could easily afford. Moreover, Reaper was chosen because it includes a powerful yet very stable spatialisation plugin, ReaSurround, which allows for arbitrary loudspeaker configuration of up to 64 input virtual (mono) sources and up to 64 loudspeakers in any configuration. ReaSurround functions as a gain matrix between the input and output channels according to a cross-fading function once virtual sound sources have been positioned in the influence zones of loudspeakers. Reaper has also introduced an innovative approach to dealing with tracks and channels. Each track can deal with multichannel sounds with up to 64 audio channels per track. In our opinion, this flexible architecture for routing greatly affects spatial sound and multichannel composition where loudspeakers, as discrete source instruments (Thigpen, 2009) or stereophonic methods, can be easily amalgamated. The final design challenge, with respect to spatial sound modularity, was to equip the studio with a modular structure for easy, fast, and efficient loudspeaker configuration. Although standard technical grid and clamp systems could have been a solution, they are heavy and not very flexible. Therefore, solutions inspired by light support systems used in photo shooting studios were investigated. Autopole systems proved to be the most attractive solution. Autopoles allow for rapid installation of vertical bars (of up to 14 feet) by pressure on floor and ceiling. Using photo C-Clamps and standard bolts, brackets were adjusted so that the loudspeakers could be fixed anywhere on the poles. This autopole-based structure can be seen in figures 4 and 5. Figure 5 Configuration of the sound studio with the Sound Window small-scale mock-up, with Anna Raimondo working on her piece In-between. Photograph: Younes Baba-Ali. If visiting artists create sound pieces, we consider designing and creating a spatial sound studio and sharing the design procedure, as reported in this section of this paper, to be part of the creative process. We believe that sharing knowledge and experience facilitates the creation, production, and diffusion of multichannel audio works. The following sections will show how these infrastructures participated in the emergence of a new sound art platform for presentation of pieces in the public domain. This first instalment took place during the 2013 edition of Espace [Im] Média. Created in 2007 by Sporobole’s former President of the Board of Directors, Sébastien Pesot, Espace [Im] Média (EIM) is a biennial media art event in Sherbrooke, Québec. From its first edition as an independently-organised three-day event based on spontaneous invitations to artists, it has experienced continuous growth with every new edition. The 2011 edition was especially important as it marked a first move towards EIM’s integration into Sporobole’s programming. It became a more ambitious event that presented two major outdoor interactive video installations by media artists Jean Dubois (in a duo with Chloé Lefebvre) and François Quévillon. These outdoor video installations were carefully positioned in a location with a large number of passers-by. In Sporobole’s efforts to gain recognition from Sherbrooke, its hometown, it was a deliberate and strategic move to determine that future editions of EIM would include outdoor artworks and installations. Between the 2011 and 2013 editions, several adjustments were made and in 2013, a new organisation was tested. Instead of one person fulfilling both roles of director and artistic director responsible of the event, it was agreed to work with four curating artists along with Sporobole’s annual programming committee. Each curator was in charge of part of the programming. In 2013, the curators were Jean-Pierre Aubé (sound performance evening), François Quévillon (outdoor installations), Sébastien Pesot (video evening), and the author of this paper, Philippe-Aubert Gauthier (sound art in public spaces). Among the invited artists were Aram Bartholl, Niklas Roy, Isabelle Hayeur, Nelly-Ève Rajotte, and Martin Tétrault. This more ambition edition was influenced by a major event, the Canada Games, which were held in Sherbrooke City during July and August 2013. EIM’s vision was also revisited and modified so as to adopt the idea of “art about media” instead of “media art”. Consequently, the range of potential works and artists could embrace a broader community of media-related artists and so bring a more varied multidisciplinary discourse with respect to media, its apparatuses, culture, and the arts. Since the event had been recognised for its impact on public spaces in 2011, funding support from the city of Sherbrooke and special Canada Games grants were easier to obtain. As a result, the 2013 EIM edition received substantial support that allowed for more ambitious installations and extended programming. For example, Aram Bartholl recreated a human-scale printed version of the Dust Mapfrom the game Counter-Strike in a 19th-century jail in downtown Sherbrooke, and Isabelle Hayeur projected a film featuring a boat cemetery on a water screen located on the lake in Sherbrooke’s downtown. Programming also included a section related to sound art in public spaces for which the author was the curator. The next sections discuss in detail the curating of the sound art portion of the programme and details of a special outdoor multichannel sound projection system. For more information about EIM 2013, readers are directed to the EIM website (ESPACE[IM]MÉDIA, 2013). From our homes to the street, from boom box to headphones, from material forms to radio waves crisscrossing the heavens, and even from the land line to the omnipresent cell phone, our individual and collective auditory sound cultures and practices are complex and intricate. The distinctions between proximity and distance, the personal and the collective, have long been associated with passive acoustical technology, that is, physical separators: walls, doors, windows and buildings, or limits between zones and spaces, places and non-places, either physical, conceptual, or fictitious (Blesser and Salter, 2009). Today, however, from our home to the street, we inhabit the trace of the transitions from the parlour, to the Walkman, to the cell phone, which have indisputably reshaped communities and auditory arenas (Blesser and Salter, 2009). With recent and accelerated sound privatisation through mobile devices, the status of aural privacy has become laden with ambiguity as one now crosses public auditory arenas with private or personal audio apparatuses, constantly reshaping these arenas, spaces, places, and auditory communities (Bassett, 2005; Blesser and Salter, 2009; Sterne, 2005). What is the place of sound mediation, listening and orality in this reshaping and crossing of lines, boundaries, and separations (if they exist)? That was the question behind the programming of Sound Art – Public Spaces for EIM 2013 in relation to past spatial sound experiments and studio residencies at Sporobole. One of the key questions was how to activate sonically the immediate neighbourhood of the Sporobole building such as had been achieved for the AIDS Wolf event organised by ASME in 2012. Here, the primary interest was not for soundscape composition strategies (Barrett, 2007) but for the soundscape as an everyday context and situation (Labelle, 2011). Sound artists explored these ideas for the 2013 edition of EIM. Two artists known for their sound art in the public space, Gordon Monahan (Canada) and Brandon Labelle (Germany), were invited. Monahan presented A Piano Listening to Itself (2010) and Labelle presented a new piece entitled Rehearsal for a People’s Microphone (2013). Even if these two invited artists were key in the artistic programming and general articulation of the event, it was the creation of a new public sound presentation platform that was more related to the topic of spatial sound creative implications and the aforementioned discussion of multichannel sound at Sporobole. A permanent multichannel sound projection system in public space was created. This innovative and permanent platform was simply named “Vitrine sonore”, or Sound Window. In the next sections, the design of the Sound Window and the related works of selected sound artists are discussed. Taking up the topic of crossing spaces, proximity, and mobile privatisation, this edition of EIM marked the launch of a unique strategy for diffusing sound art: the Sound Window. The Sound Window, a narrow yet long lineup of 16 loudspeakers demarcating the architectural boundary between Sporobole and the thoroughfare, overhangs the sidewalk and provides a singular listening experience and situation, as well as a singular creative experience. The Sound Window is shown in figures 6 and 7. The row of loudspeakers hangs just above the pedestrians. It is conceptually and legally located at the exact delimitation of Sporobole private land and the public domain. This narrow limiting space impacted the selection of loudspeakers as they had to fit in a space as to avoid making them “commercial banners” which would have entailed the purchase of permits and other fees. Figure 6 Sixteen-loudspeaker array of the Sound Window at Sporobole. Photograph: Philippe-Aubert Gauthier. Video and sound can be found at: http://vimeo.com/77542545. Figure 7 Another view of the 16-loudspeaker array of the Sound Window at Sporobole. Photograph: Philippe-Aubert Gauthier. In Sporobole’s immediate vicinity, keynotes, common sounds, and sound marks typical to post-industrial cities can be heard. The nearest source of sound is a railroad on which merchandise trains run daily, less than 50 metres away from the building, sending whistle screams, rumbling sounds, and deep vibrations. The second dominating sound source is traffic. Although this traffic is slow, the Sound Window street is connected to a parking lot so there is a great deal of movement and circulation. Pedestrian footsteps, clicks, and clangs therefore cohabit with the sound of cars. During the day, bells from the nearby cathedral mix with the ever-present humming tones of the lamps that illuminate the multilevel parking lot. Last but not least, the weekend and evening soundscapes are regularly marked by surprisingly loud dance music from local bars and terraces impinging on the walls and the buildings surrounding the parking lot. In marked contrast with soundscape compositions (Barrett, 2007) for fixed media, the artists had to deal with this contextual soundscape. It was a parameter that somewhat limited the use of approaches to composed space (Barrett, 2007) that rely on illusion of, allusion to, and simulation of a composed space. Therefore, the artists had to investigate the street soundscape, that is, to rely on an approach that couldn’t deny the listener’s space (Barrett, 2007). Artists Chantal Dumas (Canada), Erin Gee (Canada), and Anna Raimondo (Italy) had the opportunity to take up a production residency to work with this new platform for spatial sound projection in urban space. These three artists were chosen after an international call for works that was promoted to audio art, electronic music, and electroacoustic music communities. Sporobole received 39 proposals from Canada, the USA, Mexico, and Europe. The selection was based on several criteria: (1) artist statement and practice with respect to sound, music, and public space; (2) the specificity of the proposal in relation with the artistic direction of the Sound Window and the local context described above; and (3) feasibility within Sporobole’s studio and production budget, and a one-week production residency. The Sound Window had to be designed a few months prior to the event in order for proper tests to be conducted and to accommodate the artists who were going to take part in a production residency prior the launch of the event. The preliminary design guidelines were simple: a budget limited to C$8,000 CAN$ (approximately £4,600) and weather ranging from -30ºC to +30ºC with snow, ice, rain, and everything in between. Outdoor loudspeakers for patio and terrace were therefore targeted. The ASP120 6 1/2-inch outdoor speakers by TIC were selected. Next, amplifiers had to be selected. With cost considerations in mind, we were tempted by the class-T amplifier kits without the box and power supply. Since it had been determined that all the electronic components would be located indoors, there were no electrical safety issues. We opted for the four-channel Sure Electronics TK2050 Class-T Digital Audio Amplifier since it could provide 100W per channel in 4 Ohm loudspeakers for less than US$100 (approximately £60), including power supply. In this section, the artists’ statements and works for the Sound Window are described, discussed and interpreted from an independent curatorial viewpoint. The author’s aim is to highlight how visiting artists dealt with the singular projection system that is the 16-channel Sound Window. Indeed, although the selected artists were invited on the basis of their past experience and statement with respect to sound in the public space, they had total freedom as to their approach to the project. In this respect, the curator’s role was, following the selection process, to observe and take notes of the artists’ investigations and to collect their impressions of the apparatus and spatial features of the installation. None of the artists considered the Sound Window as a neutral sound projection system. All of them negotiated with its specific context: public space, random or regular listeners, linear arrangements, and the cohabiting soundscape. The first work presented between 31 July and 23 August 2013 was 86400 secondes (86,400 seconds) by the audio and radio artist Chantal Dumas from Montréal. In her work, Dumas explores the medium through sound installations, radio fiction, and electroacoustics. Over the years, she has realised more than 25 radio art pieces in which she investigates and activates sound narrative potentials through various tactics and methods. Her ambitious project for EIM 2013 consists of a continuous 24-hour piece over 16 independent channels. Dumas invited friends and relations to a special journey of 100-second blocks counted out loud, unedited except for the positioning of the 100-second samples in multichannel space and at the proper time of the day (one of the recording sessions is shown in figure 8). For this work, Dumas gathered no fewer than 92 participants to record fixed-duration chunks of time counts with varying density over 24 hours. From this massive sound pool, density variations naturally occurred when the samples where positioned in their proper time slot. Since some parts of the day-long counting process were busier (on the hour, beginning and ending of the working day, night life, etc. ), and combined with spontaneously occurring sparks of other sound samples (clocks, audible time markers, bells, and clicks), the multichannel installation offered many possibilities. Indeed, as some massive collective samples were comprised of long and exhausting numbers such as “soixante cinq mille sept cent dix-sept ... soixante cinq mille sept cent dix-huit ...”, which had to be kept on the beat at every second for every voice, the spatial distribution of voice recordings over six two-channel (or more) stereophonic pairs or spatial figures from the array proved to be a simple yet effective tactic for circumventing any confusing clusters with overlapping voices, sometime spoken in different languages (French, English, German, etc., to a total of ten different languages). This is known as spatial release from masking in the auditory and psychoacoustic literature (Litovsky, 2012). Indeed, masking of different sounds is reduced if they emerge from different spatial positions with respect to the listener. This has also been discussed in the electroacoustic music literature (Gauthier, 2009; Otondo, 2008). With sometimes six or eight simultaneous multi-lingual counting voices, and some humanised off-synchronisation and rapidly breathing athletes’ voices, composing this piece for two-loudspeaker system could have greatly complicated the auditory experience for passers-by, as well as audio mastering for clarity and voice intelligibility. For Dumas, this was circumvented by using previously composed and fixed sets of one-channel and two-channel source tracks that were routed to groups or clusters of loudspeakers forming a composed set of spatial figures. Figure 8 A 100-second recording session for Chantal Dumas’ 86400 secondes in Sporobole’s studio. Photograph: Chantal Dumas. Such an approach to spatial composition proved very successful for Dumas in terms of productivity, keeping in mind the challenge of working with a 24-hour procedural composition, while relying on precomposed channel routing and spatial figures on different determinations of scales, widths, and space. Some of these spatial figures combined closely-spaced loudspeakers, others encompassed the most distant loudspeakers as a large stereophonic pair, also playing with the idea of size and envelopment. Although these multichannel stereophonic planes could hardly be perceived as such, they were key productive and compositional elements as the daily users of the sidewalk perceived different voices, chorales, or perspectives as they moved from one pair of speakers to a wider pair below the Sound Window (walkers typically spent 20 to 30 seconds on the sidewalk in front of Sporobole). In this respect, 86400 secondes succeeded in conveying the concepts of sound time and sound space in a complementary manner that aptly reflected the artist’s original interests for the voice and collective voice in media and art forms such as radio, and worked as a giant sonorous public clock made out of the most personal sound, the human voice. Reading this work within a musical and acousmatic analytical framework, the sound-as-such, procedural, and documentary method of Dumas is in marked contrast with “text-sound composition” approaches where sound transformation and the “removal of semantic intelligibility” (Barrett, 2007) are often a creation axis. Even if cases of acousmatic works where the semantic meaning is important (Barrett, 2007) are known, Dumas’ 86400 secondes is still very different from a prose- or spoken-word-based piece in the sense that here the semantic meaning is minimal: keeping track of time. The poetic emerges not from the meaning but from the interaction of listeners and local soundscape with a sonically-marked time. As several authors have noted (Blesser and Salter, 2009; Labelle, 2011), architecture and buildings, built out of wood, concrete, and steel, all operated, and still operate, as acoustical technologies. They are channels that shape acoustic arenas and communities within a continuous multi-sensorial struggle for power: private power, secrets, public power, governments, decisions, meetings, committees, and boards of directors, all taking place behind walls and closed doors (Blesser and Salter, 2009). These past acoustical technologies, once the main mediating channels for sound and oral intimacy, have now dissipated, or have been forgotten with the advent of electrical and digital sound apparatuses and the communication realm that we now typically consider as the main instigator of sound media. Anna Raimondo, of Italy, is known for her sound work in public spaces, from the street to the radio. Her work, mainly based on the voice, languages, and the process of translation, lies in between sound and radio, performance, and urban intervention. Playing with the potential of sound for intimacy and intimidation, Raimondo aims to foster a negotiation between verbal and non-verbal communication and the active participation of the audience. For the Sound Window, she revisited the idea of architectural limits as boundary conditions of intimacy, privacy, and public realms through recording many surfaces and delimitation boundaries of Sporobole’s building: windows, frames, doors, walls, floors, and roof hatch (see figures 9 and 10). These elements were then assembled for In-Between, a 20-minute composition that sits at the fuzzy border between sound art and electroacoustic music. Dealing with contemporary issues derived from these two concurrent practices, such as space and time transactions, Raimondo created a structured and spatially-organised composition based on the idea of transition between spaces or rooms. She introduced continuous fluctuation between what one could consider as fixed acoustic arenas delimited by more or less sound isolating frontiers (Blesser and Salter, 2009). Her approach relied on a balanced combination of: (1) soundscape composition strategy and artistic heritage (Barrett, 2007), and (2) sound-art and documentary vision of the two soundscapes, that is, the recomposed inner space of Sporobole and the given contextual space of the street. Figure 9 Anna Raimondo and Younes Baba-Ali recording the sky and city from the roof hatch of Sporobole. Photograph: Younes Baba-Ali. Figure 10 Anna Raimondo and Younes Baba-Ali recording the sky and city from the roof hatch of Sporobole. Photograph: Younes Baba-Ali. When Raimondo was preparing her composition at Sporobole’s studio (see figure 5), we had several and informal discussions about how to deal, from a compositional and technical standpoint, with 16 independent channels. This was her first experience with such a channel count. Raimondo, with the collaboration of the artist Younes Baba-Ali, used several layers or scenes of spatial organisation. Some preliminary parts relied on a simple yet efficient way to deal with such a system, that is, the loudspeaker as point-source instrument (Thigpen, 2009) where one monophonic track is connected to a loudspeaker without panning between loudspeakers. This strategy had been used in a first part produced using recordings from Sporobole’s electric room to create a vast sound mass with channel-per-channel drifts, phase shifts, and micro-variations that blended with the general background humming of the parking lot, lamps, rooftop fans, and ventilation systems. This subtle blend was detrimental to creating a real transparent transition from the actual and composed soundscapes. Subsequent parts of the composition relied on a similar strategy combined with economical amplitude panning and loudspeaker crossfades using ReaSurround and a loudspeaker layout corresponding to the Sound Window. Some spatial objects were treated as fixed masses, large clusters, or localised points, while others were treated with rapid movement using amplitude modulation of virtual source position within ReaSurround. In this case, as the sound travelled very fast, it was fascinating to hear this compositional strategy, not as production of a moving monophonic sound, but more as a completely spatially-informed and complex or diffuse soundscape (Breebaart and Faller, 2007, p. 45) of a sound source within an environment that recreated, through the Sound Window, inner parts of Sporobole’s normally inaudible rooms, tones, resonances, and boundaries. In this sense Raimondo’s piece, while being equally interesting to listen to as a musical and acousmatic work and to think of as conceptual sound art, precisely executed and mastered one of the key curatorial elements for the Sound Window, that is, promoting an active and experiential revisiting of the often taken-for-granted fixed boundaries between private and public sound spheres. The last piece presented was 7 Nights of Unspeakable Truth by audio and media artist Erin Gee (Canada), whose practice focuses on digital culture through the exploration of human voices in electronic bodies. This piece is a long-form composition consisting of Gee’s documentation of her dusk-till-dawn searches for numbers stations on shortwave radio frequencies. Numbers stations are radio broadcasts that consist only of numbers, tones, and codes. Typically associated with secret plots, control tactics, military transmissions, and various mysterious projected imaginations, numbers stations are rare and scarce in both time and carrier frequency domains. This obscurity likens them to other obscure, strange, and supernatural phenomena often found in electric media, whether they be from radio static, or disc or skull surfaces (Kittler, 1999; Auner, 2013, p. 139). This work was presented from 12 September to 20 October. For seven nights of over eight hours, Gee scrutinised the electromagnetic sky (see figure 11) for these robotic voices of women reading out numbers, these “fantasies of communicational technology” and superstition that intertwine electricity and moving invisible energies “into images of ghosts, spirits and telepathic exchange” (Labelle, 2011, pp. 231 and 234). The listening culture of numbers stations is charged with something not dissimilar to “the possibility of noise, misprision, and appropriation that would always be in conflict with standardisation of the radio waves” (Labelle, 2011, p. 235). Interestingly, the raw, the mechanical, and the strict forms of numbers stations can only simultaneously enhance this impression of standardisation, hence charging these broadcasts with fascinating polarities. For her piece, Gee exploited this idea of search through extended and recorded tracking sessions. She recorded both the direct sound of her radio receiver and the amplified sound of the receiver over a loudspeaker in the improvised recording area (see figure 11). This resulted in 56 hours of recordings. Gee’s recording sessions were carefully structured around the audible search for various types of statics, codes, Morse transmissions, numbers, and noise, with an accompanying graphic “score” that described discovered sounds. Using an inventory perspective, the artist presented the seven nights in synchronised playback from left to right of the Sound Window, hence confusing the idea of time and space in a manner that documented the recording performance while operating as a log book. Chronologically ordered, from day one to day seven, the recordings allowed visitors to walk through seven evenings of shortwave, synchronised to their respective times. This spatialisation of each night allowed listeners to make comparisons and discover patterns revealed in Gee’s search. This work also blurred the frontier between sound art and electroacoustic music. When listening closely to these spatialised audio documents, one could only “listen through” for something else, “sound’s expanded situation” (Kim-Cohen, 2009), while from a physical distance the seven nights blended into a mysterious, sonorous, and musical mixture of timbres that evolved, over a number of sections, towards a musical sensation, something like the sound itself. Figure 11 Erin Gee’s recording area for the creation of 7 Nights of Unspeakable Truth. Photograph: Erin Gee. As in Dumas’ work, Gee’s approach to human, or robotic, voices is of a documentary or ready-made type. Out of the ubiquitous yet invisible radio frequencies and signal-encoded electromagnetic fields, Gee extracts and collects recorded voices as though from a post-apocalyptic situation, while blending characteristics of past recorded voices (such as the uncanny and disembodied) with futuristic visions of the ubiquitous synthetic voices that go unnoticed (Auner, 2013) in our day-to-day lives of spatially-distributed medias and computing devices. This paper has shared and discussed Sporobole’s short history of spatial sound experimentation and its developments. It is hoped that the text properly reflects our aim to create a multidisciplinary and creative context that blends many activities including curatorial practices, studio design, artist centre development, production residency, and sound system design, as well as various sound-related disciplines at the crossroads of (sound) art, (electroacoustic) music, (audio) technology, and (acoustical) science. Reflecting on the meaning of these recent experiments, the author would suggest that what has characterised Sporobole’s approach might be its hypothesis that sound projection systems in public spaces, like the Sound Window, are not neutral or transparent apparatuses. They directly affect, either conceptually or practically, the creative strategies favoured by visiting artists, as well as the reception of such works by a non-specialist audience. Another common feature of the developments and works reported here is the distinction between a geometrical, or cartesian, space, and space as a place or site. While several texts on creative approaches to spatial sound composition within the context of acousmatic music focus on the compositional and technological means to create, localise, or shape sounds in space, most of the works that emerged from Sporobole show an indirect and subtle approach to spatial sound as a topic rather than as a compositional potential. By blending the works with their immediate soundscape, the Sound Window artists favoured a non-intrusive, pervasive (and somewhat subliminal), and non-representational approach to sound space in the urban and mediated context. This shared working approach addresses issues raised by recent writings on the topic of ubiquitous media and ubiquitous computing (Ekman, 2013). Here, the indirect and subtle approaches to spatial sound fit “Ubicomp” culture and ubiquitous media: something that emerges from media technologies that stands in the periphery of our attention and that goes unremarked in spite of the technological apparatuses’ extended spatial distribution and densification. For the near future, Sporobole’s team is working on new spatial-sound workshops and a production residency programme that will integrate both the sound studio for production and the Sound Window for diffusion of multichannel sound works. ASME acknowledges the financial support of the Canada Council for the Arts. Sporobole acknowledges the financial support of the City of Sherbrooke and the Conseil des arts et des lettres du Québec. Espace [Im] Média acknowledges the financial support of the City of Sherbrooke, Destination Sherbrooke, Conseil des arts et des lettres du Québec, and Canada Council for the Arts. Chantal Dumas thanks the participants for their contributions to 86400 secondes. Anna Raimondo acknowledges the support of the project DE.MO./MOVIN’UP I sessione 2013. Auner, J. (2013) Losing Your Voice: Sampled Speech and Song from the Uncanny to the Unremarkable. In Ekman, U. (ed.) Throughout – Art and Culture Emerging with Ubiquitous Computing. Cambridge, Mass. : MIT Press. Ballou, G. (ed.) (2008) Handbook for Sound Engineers. 4th ed. Oxford: Focal Press. Barrett, N. (2007) Trends in electroacoustic music. In Collins, N. and d’Escriván, J. (eds.) Electronic Music. Cambridge: Cambridge University Press. Bassett, C. (2005) “How Many Movements?” Mobile Telephones and Transformations in Urban Space.Open, 9, pp. 38–47. Berkhout, A.J., de Vries, D., and Vogel, P. (1992) Wave front synthesis: A new direction in electro-acoustics. 93rd Audio Engineering Society Convention, San Francisco. Blauert, J. (1997) Spatial Hearing. Cambridge, Mass. : MIT Press. Blesser, B. and Salter L.-R. (2009) Spaces Speak, Are you Listening? : Experiencing Aural Architecture. Cambridge, Mass. : MIT Press. Breebaart, J. and Faller, C. (2007) Spatial Audio Processing: MPEG Surround and Other Applications. Chichester: Wiley. Ekman, U. (ed.) (2013) Throughout – Art and Culture Emerging with Ubiquitous Computing, Cambridge, Mass. : MIT Press. ESPACE[IM]MÉDIA / Arts et cultures numériques (2013) ESPACE[IM]MÉDIA / Arts et cultures numériques. [Online] Available at: <http://espaceimmedia.org> [Accessed 11 November 2013]. Gauthier, P.-A. (2009) Transparence sonore: acoustique physique; opacité sonore: un phénomène psychoacoustique; implications en créations sonore. In Paquet, B. (ed.) Faire œuvre: Transparence et opacité. Québec: Presses de l’Université Laval. Kahn, D. (1999) Noise, Water, Meat. Cambridge, Mass. : MIT Press. Kim-Cohen, S. (2009) In the Blink of an Ear. New York: Continuum. Kittler, F.A. (1999) Gramophone, Film, Typewriter. Stanford: Stanford University Press. Labelle, B. (2006) Background Noise. New York: Continuum. Labelle, B. (2011) Acoustic Territories, Sound Culture and Everyday Life. New York: Continuum. Landy, L. (2007) Understanding the Art of Sound Organization. Cambridge: MIT Press. Licht, A. (2007) Sound Art. New York: Rizzoli. Litovsky, R.Y. (2012) Spatial release from masking. Acoustics Today, 18, pp. 18–25. QRD diffusers (2013) QRD diffusers: Technical Overview. [Online] Available at: <http://www.subwoofer-builder.com/qrd.htm> [Accessed 10 November 2013]. QRDude (2013) QRDude: Quadratic Residue Diffuser calculator. [Online] Available at: <http://www.subwoofer-builder.com/qrdude.htm> [Accessed 10 November 2013]. Rumsey, F. (2001) Spatial Audio. Oxford: Focal Press. Sterne, J. (2012) MP3, The Meaning of a Format. Durham, NC: Duke University Press. Sterne, J. (2005) Urban Media and the Politics of Sound Space.Open, 9, pp. 6–14. Thigpen, B. (2009) Spatialization without panning. eContact!, 11(4). [Online] Available at: <http://cec.sonus.ca/econtact/11_4/thigpen_spatialization.html> [Accessed 14 August 2014]. Voegelin, S. (2010) Listening to Noise and Silence: Towards a Philosophy of Sound Art. London: Bloomsbury Academic. Williams, E.G. (1999) Fourier Acoustics. London: Academic Press. Philippe-Aubert Gauthier was born in Chicoutimi (Canada) and now lives and works in Sherbrooke (Canada). He is a sound and digital artist, junior mechanical engineer, M.Sc, and Ph.D. in acoustics. He is currently working as a researcher at the Groupe d'Acoustique de l'Université de Sherbrooke. The heart of his artistic practice is based on the interactions of arts, cultures, sciences, and technology in an integrated research agenda where each of these fields and related knowledge are used as primary materials for the development of art and musical pieces that directly address, through an experiential approach, the social constructions of technology and technologically-related culture within a critical framework.